Let’s just say I get a lot of coffee cards. When I recently cleaned out my purse, I had 23 gift cards and used an idea I found on-line to get them all organized. 9 of these were coffee cards (8 Starbucks and 1 Tim Horton’s). It’s not that I don’t like Starbucks, but I generally only go there when I have the uncontrollable urge for one of their yummy cake pops. I only drink coffee in the morning before work and there really isn’t a Starbucks in my area of the city or on my route to work. So, I have 8 cards, all with varying balances and they seem to be in every nook and cranny of my purse. The solution…..
Did you know that you can create an account on the Starbucks website, load your cards and then transfer the balances from all of the cards onto one single card. Yay!! I also learned that you can send e-cards by transferring money from your account balance on your primary gift card. 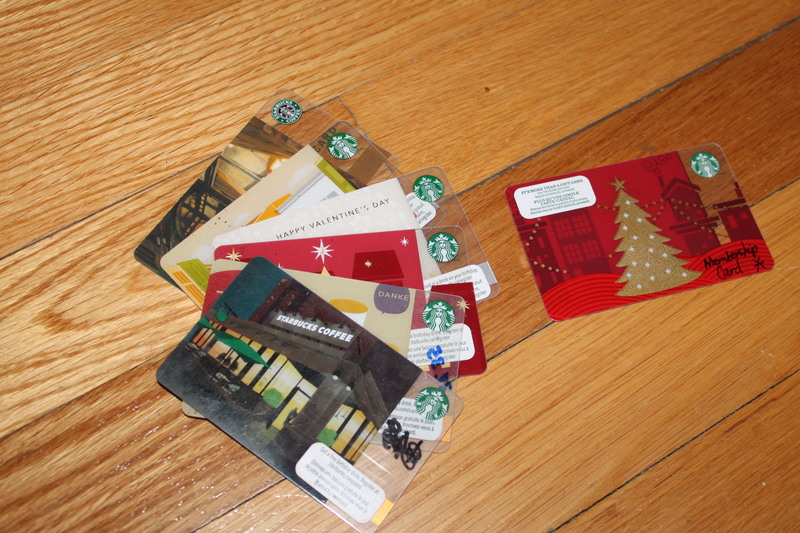 So, when all was said and done, not only did I organize all of my gift cards, but I also managed to combine my 7 Starbucks gift cards on to one (I re-gifted the 8th one). I was able to take all 7 of my Starbucks gift cards and transfer them onto one card. I am not sure if other companies offer this same option, but coffee cards seem to be what I get so many multiples of. I don’t have an iPhone, android or any other kind of modern device. In fact, my phone is what I like to call a classic. I so seldom use my phone that I haven’t been able to justify the need for a new one….for a very long time. I think it has a camera, but I am not even sure. It might have a texting function, but I am way too impatient to ever be able to push the number the correct number of times to get the letter I want. I know it’s not bluetooth compatible because I actually looked into that. It rings and dials and that’s pretty much it. I can’t even say that it keeps its charge well, in fact, this may be what forces me to upgrade and get with the times. What I’m getting at is this…my reference to this link is not based on my own personal experience, but rather on a concept I find intriguing. This link shares information on 3 apps that have been designed to help you organize your gift cards. In a nut shell, you plug-in the card information and your phone tracks all of your cards and the balances. It is my understanding that you don’t even need your actual gift cards, but can just use your phone and the app to access the account. Simply genius. Some day when I grow-up and have a big girl phone, I am so going to get one of these apps. Posted on March 22, 2014 by Cindy Roy •	This entry was posted in Organization and tagged apps for gift cards, combining gift card balances, organizing your gift cards. Bookmark the permalink.